This article was originally published at dadomatic.com. It’s that time of year again. It’s time to sort the CDs. Oh, I’m sure you’re thinking “Why don’t you just keep them in order as you use them?” and normally I would agree with you. After all, that’s how I use them. But I live with children. Four of them to be exact. And I foolishly managed to teach them to appreciate and even love my music, so from the first one all the way to the last they help themselves to my CDs. It started with my oldest who liked to help reorganize them. Obviously, I knew 17 years ago that my tidy little world was going to become a whole heckuvva lot more cluttered when we started having children. However, I never realized that this clutter would come in such cute packages. How can you get upset at a five year old who proudly alphabetizes your genre sorted collection A-Z? Or were they color coded? Time has erased that painful memory. I originally fought it. I’d re-sort things back to how I liked them, then find them re-sorted again. I tried scolding. I tried threatening. I even tried GRAND EDICTS OF POWER. All to no avail. She loved my CDs too much, and her sisters were just like her. I took to reorganizing only once or twice a year just to avoid the high blood pressure, especially when their reorganizing system seemed to involve physically relocating my CDs into head puzzling places. Take today, for example. As I brought order back to cacophony, I discovered my missing Perfume CD. Gone for eight or more months, I had despaired of ever finding it. Nothing to worry about. It was only a limited edition import from Japan. Of course it belonged in the Lord of the Rings soundtrack case tucked behind my CD cabinet. What more natural a place could there be? And sticking the Lord of the Rings soundtrack CD in the Henri Mancini case was pure brilliance. They share so much in common. I had ripped those tracks eons ago and might never have looked there if I hadn’t discovered the Henri Mancini CD behind the cabinet, as well. These days my older girls raid my MP3 collection and one day I imagine I won’t have to worry about reorganizing so much. By the time the CDs stay where I want them it will be time to pack them away with the LPs. The upside to all of this is that I’ve spent the past decade sharing my bands with some enthusiastic fellow listeners. 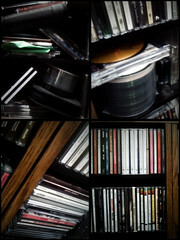 If the price to pay for sharing my love for music is a messy CD cabinet, then I’ll gladly open my wallet. My mother might point out that I used to love her music collection, too. Did you know that LP grooves are great for matchbox cars? If you apply enough pressure you can force the cars to stay in the grooves, except for when they wipe out and collide with oncoming traffic. Oh, those poor LPs. Maybe I’ve grown up along with my girls. Whereas in the past I would find reorganizing my CDs frustrating, today I found myself chuckling. My girls are even discovering new bands all by themselves now and I find myself raiding their collections for a change. Like reading A Splintered Mind? Share articles with your friends, link from your blog, or subscribe!